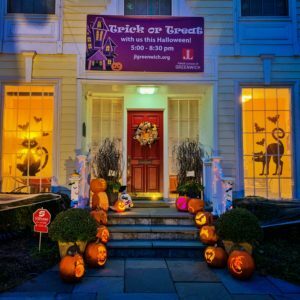 The Junior League of Greenwich (JLG) hosted more than 200 trick-or-treaters on Halloween night at the JLG Headquarters on East Putnam Avenue. With the Junior League Headquarters located in the heart of a popular neighborhood for trick-or-treaters, the JLG invited local parents, kids, and pets to stop by for refreshments and candy. Many families used the house as a meeting point to begin their Trick-or-Treating down Park Place; a street known by locals for its many haunted houses on Halloween night. The Junior League of Greenwich looks forward to continuing this now annual tradition serving the Greenwich community. Click above to read more!